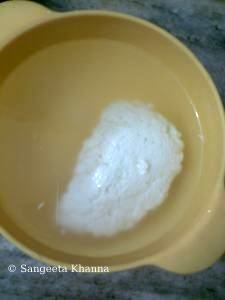 Somebody asked me if I have rasgulla recipe on my blog. I told that I have a picture ready and will post it soon. But when he started asking about the procedure and the syrup proportion etc. I thought I need to make it again and take pictures of all the steps. More so because I have been using andaza (approximate) measurements regarding the sugar syrup for rasgulla cooking. 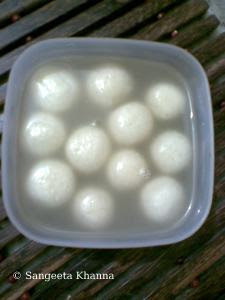 Rasgulla can be described as a spongy ball of cottage cheese that soaks up the sugar syrup it is kept submerged in. 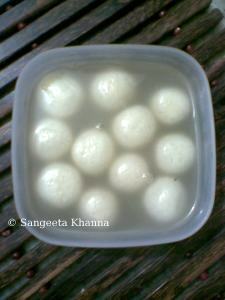 Rasgulla is always served with some of the syrup so it stays 'hydrated' when it reaches you, and you never bite into a spongy rasgulla, you gulp it down at once. The syrup comes oozing out onto your clothes if you bite into a spongy rasgulla. Banarasis have this 'acid test' for a good rasgulla. I wanted to give exact measurements of the sugar and water ratio for the recipe, but I failed miserably regarding calculating an exact syrup consistency. I feel there is nothing like an exact syrup consistency for making rasgulla. Some people like it thin and some others like it a bit sweeter. So adjusting the sweetness is the key*. I took pictures of making paneer as that is the most important step of making rasgulla the other step is just like eating the rasgulla. Yes the cooking procedure is a cakewalk once the paneer part is perfected. The pictures are not very good as I made these in night but I feel it demonstrates the process well. Let's get started with the procedure as I can't wait for a good rasgulla, and can't eat a bad rasgulla for that matter, especially the ones available in Delhi. Firstly heat the milk in a saucepan and wait till a layer of fat comes on top and you see the wrinkles (as you might have seen just before boiling starts), I wanted to take a picture of this stage but my cell phone camera would have been a dud at this. So this is the time when you have to put the heat off and start adding the lemon juice or curds. I used fresh lemon juice this time as a plump and fresh lemon was sitting on the counter already (from my garden). If using lemon juice you have to add drop by drop and if it is curds (dahi) you can go spoon by spoonful, stirring while adding. The milk should curdle slowly after each addition. Continue adding the juice till the whey becomes transparent, juice of half a lemon or about 15 ml will be enough and if you see that still the whey has not separated it means you need to heat the milk a little. Heat some more while stirring and it will curdle. You have to keep a large bowl of hot water ready for rinsing the paneer. And rinse the cheese properly by pressing it with spoon to the sides of the bowl several times. The water gets milky (another good sign).. Pass it through the sieve again and press with fingers to drain any excess water. No need to press hard as it doesn't take any water from the dip. Take out from the sieve and mash with fingers till a smooth dough is formed. No muscle is needed for a small quantity like this, just make it smooth. You can use the base of your hands, it is a quick step. See in the picture it does not look really smooth but the thing to keep in mind is that it should be cohesive and soft, should bind together and not be crumbly and dry. If the paneer is not good it is crumbly and if you find that your paneer mash is crumbly and dry at this point stop making rasgulla, as they will disintegrate in the syrup. 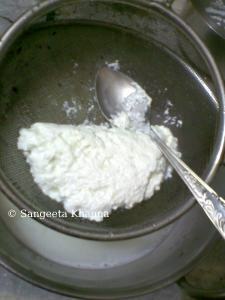 * check out when you are making the balls, the mashed paneer should be cohesive and should not be crumbly. Iit should be easily shaped into a ball, if it takes effort to bind or the paneer ball has cracks visible, it means it will make hard rasgulla or most probably disintegrate into the syrup. * I used Amul full cream milk and it was good enough, ideally cow's milk is considered best for making rasgullas. It has become quite a long post as I wanted to make the finer points clear. Many a times I have heard that they did not expand in the syrup or disintegrated. Actually one of my friend who is in UK asked me the recipe and I told her over the phone. Later she told me that rasgullas were a bit hard. So it is for her and for the gentleman who inquired for the recipe. 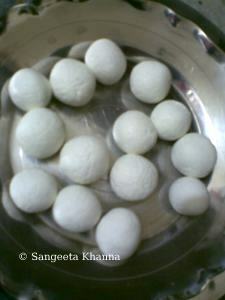 But be assured, it took me less time to make the rasgullas than writing this post. Trust me. thankyou for the nice words ...Dear Ushnish..
we have always lots of milk to be used up and i will give this a try sometime soon... you describe the recipes very well, making them seem so easy! Looks perfect & awesome...Always use to buy from stores..Never tried at home..My fav sweet sangeeta..So thanks for step by step presentation..will try out..
wow...........lovely step by step discription dear................rasgulle is looking delicious. 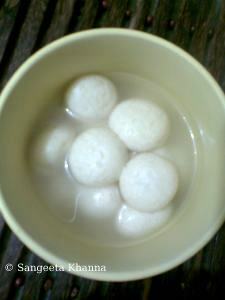 I love ragullas! have made it at home ..but that is really long ago :) I have happily lost the recipe paper too! the store ones arent pocket friendly, thanks for the detailed recipe.I have saved this post. yummm.yummm....mouthwatering recipe...yaar tumne toh banaras ki yaad dila di ,now u forced me to try this rasgulla...i cant resist anymore. Hi Sangeeta, this is lovely. I have never tried Rasgulle before, but my husband has! When he was abroad and was supposed to take 75 rasgulle for an office pool party. Yours look so spongy that I feel like having one right now. wow, yummy and my favourite too, I am going to try this one surely. Please sign your initials when commenting so that the pleasure of a complement is complete. I am planning to post cham cham recipe as i have a few more requests regarding that. stay tuned in.....the feedback is precious for me....thanks again. Your rasgullas look awesome. I too am able to make decent ones but they most of time the bigger ones don't hold shape - they are more like rasmalai shape. Smaller ones remain round. Do you have any idea abt that. I used fresh home made paneer. 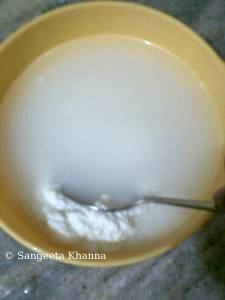 My prcoess is - When the milk curdles, I dump in ice to stop cooking process and further rinse with cold water. Then I run it in food processor until its sticky paste. I have experimented with different consistency stages and this one gives the softest rasgulla. Only problem is no round shape for bigger rasgulla. Any idea why? Will washing in hot water help? I hope you add the vinegar or lemon juice in the milk just before boiling temperature is reached as i have mentioned here and have indicated the signs to judge when it is the right time to add the vinegar . 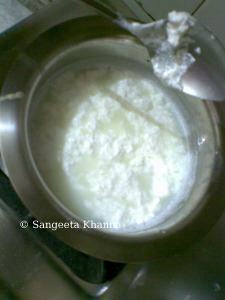 Also the vinegar has to be added bit by bit so that the milk does not get a shock and the resulting curdled chhena is soft and not in the form of hard coagulated masses . You need not add any ice cubes to stop cooking , and as soon as you see a clear whey you should strain the liquid and wash the resulting chhena in warm or hot water as i have indicated. Small details are important and the end product depends on them. Also you should make a plenty of sugar syrup so that all the rasgullas get free space to expand. try this exact method and let me know if you succeeded. As i said it can be mixed into a mixie jar , i use a chutny jar for the purpose and push the contents with a spoon a few times to allow even blending , no water is used and for smaller quantities i use my hands and it's very quick that way too. I slowly add vinegar just before milk starts boiling. Will try to do it slower next time. Also will wash in hot water next time. Will let you know how it goes next time. Thanks for your tips. Hi Abira ...The chhenna becoming very sticky n creamy should not be due to not straining the water well....it seems your whey didn't get clear when you were curdling the chhenna . Is that so? If the chhenna doesn't curdle well leaving a clear whey , it may remain grainy(which may look creamy due to minute size of grains) and may not bind well to make balls. The balls getting cracked is due to the same reason. Let me know if your whey was completely clear ...Also, what type of milk did you use? 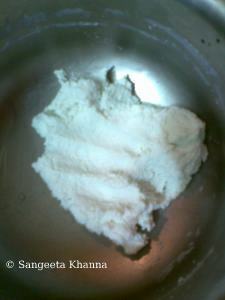 Amazing- how the simple act of boiling can turn ordinary paneer into rasgulla! But I havent been able to make paneer cubes as good at home as they are from the market- it becomes kind of chewy- do you have a tip? Hungry for rasgulla at 5am? Does that make sense? YUM!! Is it ok to use shop paneer for making rasgulla --instead of making paneer at home? Is there a paneer brand u were satisfied with. Thanks ! Hello Ram, For rasgulle you need only the freshly made paneer that is still warm, this way it kneads well and smooth so the rasgullas become spongy when boiled in the syrup. The store bought paneer can however be made into another mithai called chhena murki pr chhena paag, just cook the paneer cubes in sugar syrup till the sugar caramalises lightly, cool and have as required. i have tried rasogulla many times reading different posts. from your post i got perfect chenna. 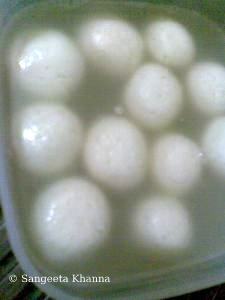 then I made rasogullas they were spongy too.. and all texture as you mentioned. just that they were not perfect round a bit flat. I read different people talking about size of utensil, the amount of sugar syrup etc..
as a habit i do not wish to use pressure cooker. Please from your experience can you help me decide about size of utensils, preferred shape of the utensil and amount of syrup .some said 1/3 of the vessel well it did not work for me.I asked one more post but did not get any proper reply. 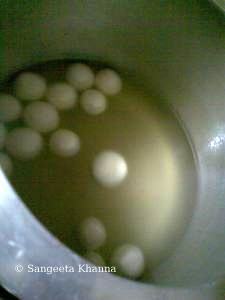 The amount of syrup for making rasgulla should be enough to allow the rasgullas to float and expand freely. 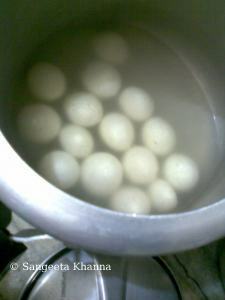 So cook the rasgullas in batches and keep the depth of the syrup three times the expected size of the rasgulla. Even I crowd the rasgullas sometimes and get flattened shapes but it's okay as long as they are spongy and soft.